Harlow Shapley once referred to Leslie C. Peltier as "the world's greatest living amateur astronomer." This was a view shared by all who knew him, or knew of him. During his active observing life, which spanned all, or parts of eight decades, he made over 132,000 observations of variable stars, discovered twelve comets and six novae. He was author of three books: Starlight Nights (for which he was named Ohio Author of the Year in 1966), Guideposts to the Stars, and The Place on Jennings Creek. Many prominent astronomers today, such as David Levy, were greatly influenced and inspired by his work. When Leslie Peltier died in 1980, it was felt that the Astronomical League should prepare a lasting tribute to this man who represented the best that our common avocation has to offer. 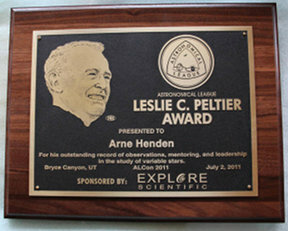 A stranding resolution was passed at the 1980 League Convention in Dallas, Texas establishing the Leslie C. Peltier Award for significant contributions to observational astronomy. The award became a reality when Mr. John Diebel, president of Meade Instruments, agreed to sponsor it. The award consists of a 12" X 9" goldtone cast plate on a 15" X 12" walnut backing. It is a magnificent object to behold. Since 1980, there have been thirty recipients of the award. Names in blue or bold type are AAVSO members. 1998 Roger Sinnott General astronomy. Atlas preparation. 1984 Walter Scott Houston Variable stars, "Deep Sky Wonders"
1980 Leslie C. Peltier Variable stars, comet & nova discoveries, general observational astronomy. They must be received by no later than April 1 for eligibility for that year. The award is presented at the National Convention of the Astronomical League.